Traditional stately sunflowers (helianthus annuus) with their bright yellow blossoms are old garden favorites. Hybridized Russian and Israeli varieties which have superior large grey and white striped hulls are commercially grown in vast fields throughout the US and into Canada. The seed is used as feed, the production of sunflower oil and many other consumer products. They will happily grow in natural soils in all but the most northern climate zones. Improving the soil with manure and/or compost is recommended to facilitate strong healthy growth. Recent cultural developments for the garden enthusiast include colors ranging from white to brown. They also come in a variety of sizes from miniatures of about 2 inches across to giants up to 8 foot tall with bloom the size of dinner plates that can produce extremely large seed heads. Sunflowers can be used as background plantings where the larger varieties will make a spectacular and effective screen for very little money. Smaller plants are suitable for the flower garden or borders. The smaller varieties also make lovely bouquets to display in your home. Sow sunflower seed when weather permits in early spring - right where they are expected to grow. Any average garden soil will do so long as they are planted in sunshine and are kept reasonably moist. Plant seed about 1/2 inch deep and 8 to 12 inches apart, depending on the variety. Once well established, an application of fertilizer will greatly benefit them and help to increase flower production. Keep in mind that the sunflower is phototropic. This means that the flower buds will follow the movement of the sun from east in the morning to west in the afternoon. When flowers are fully open, they will usually remain facing east. 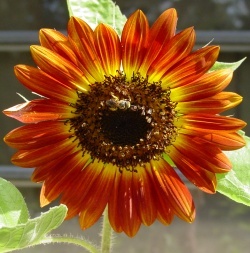 You can easily collect sunflower seeds for planting next season or to feed birds during the cold winter months. You may also want to save some of the larger varieties for yourself. A simple method is to tie a piece of cheesecloth, fine nylon or plastic mesh around the ripening seed head when the back portion of the head begins to turn brown. This will prevent birds from harvesting the seed before you do. Once the seed head shrivels and the seeds are dry, just rub them into the covering. At this stage, the plants will probably have become unsightly. You can now cut the stalks at ground level and dispose of them or chop them up and put on your compost pile.